The eleven volunteers from Grand Junction seemed to have forgotten about their early start when they arrived at the San Salvador airport late on Tuesday evening. There was an absolute “yes” vote to stop at a pupusería and try out the local specialty, the pupusa, a thick corn tortilla offered with a variety of savory fillings. The combination of pupusas and the 6:00 a.m. flight from Grand Junction meant everyone was ready for bed when we reached the San José Hostal, a comfortable, family-owned and managed guest house in San Salvador. After breakfast on Wednesday morning the group got to work straight away, taking the supplies we had carried from Grand Junction for the spay/neuter campaign to the clinic owned by Diana, a local veterinarian who has played a key role in getting this campaign off the ground. 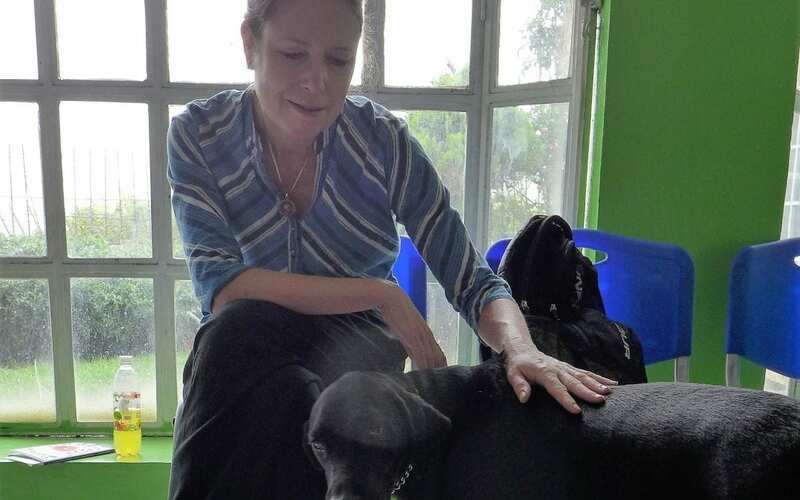 We arrived at the clinic and met Diana, the clinic staff, and most of Diana’s own collection of ten dogs, who quickly won hearts and minds. Back to business, Anna Stout started by coordinating the inventory and organization of supplies. We were soon joined by a third veterinarian from Mexico, Dr. Tony Rios, who has participated in many large scale spay/neuter campaigns. Anna and the three vets organized the supplies in the order they will need for the campaign, while the other volunteers offered support, took time to talk with other staff members at the clinic, or showered affection on Diana’s dogs. Bins were purchased for transporting supplies to the campaign and for safely storing any leftover or reusable supplies for futures campaigns. With the inventory complete, we were left with some time to get to know the city before the real work starts on Friday. The first stop was lunch at La Pampa, an amazing Argentinian restaurant situated close to the top of the Boquerón volcano that overlooks San Salvador. After lunch, a few runners took advantage of the hills and steps in the restaurant grounds to burn off some pent-up energy. We had all been duly warned that running in the streets of San Salvador was not going to happen because to the high crime rates in the city, so this was a welcome bonus. After a leisurely lunch above the clouds, we descended the volcano for a tour around the older part of San Salvador. We saw one of the first houses constructed by the Spanish settlers, impressive government buildings, colorful street vendors selling everything from cotton candy to an iPhone charger, and ending up at the magnificent Catedral Metropolitana, where our travelers appeared to enjoy a moment of calm, a far contrast from the hustle and bustle in the plaza outside. After dinner, we took the supplies back to the hotel, where volunteers are still working cutting and folding surgical drapes as I write late into the night….